These homemade Hot Cross Buns are as traditional as they come! Soft and fluffy with juicy raisins and a sweet glaze top, they’re perfect for Easter! Of all the Easter recipes I see every year, hot cross buns are probably my favorite. The sweet and spicy taste always takes me back to when I was a kid. I’d eat them in the weeks leading up to Easter and then be bummed to have to wait another year to see them again. 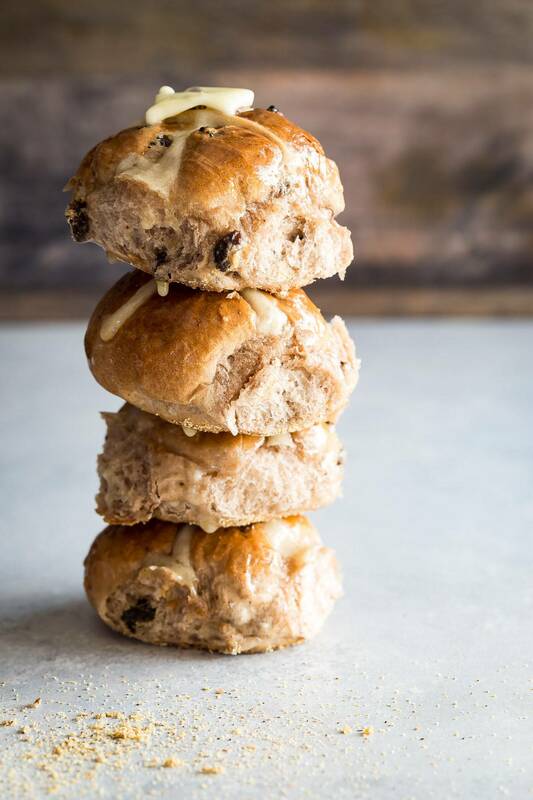 I posted a different hot cross bun recipe last year but wanted to come up with an easier, no-hassle recipe for this Easter. This time I based the dough on a recipe I’ve been using a lot lately. I use it for any sort of sweet bread I need to make, like this Cinnamon Crumb Bread or these obnoxiously good Triple Berry Breakfast Buns and it hasn’t let me down yet! How long will it take for my dough to rise? That depends on a lot of factors like how hot and humid your kitchen is. Yeast needs humidity to rise so I always like to set the bowl with the dough in it either in direct sunlight, on top of the laundry dryer or turn on the oven to 200 degrees then switch it off once it reaches temp. Cover the bowl with a towel and gently place the bowl into the oven. You’ll know when the dough is ready because it will have doubled in size. Like all yeast recipes, waiting is the hardest part. Take a deep breath and relax while the yeast works its bubbly magic. Making bread and other yeast products is a game of patience but the rewards are amazing! 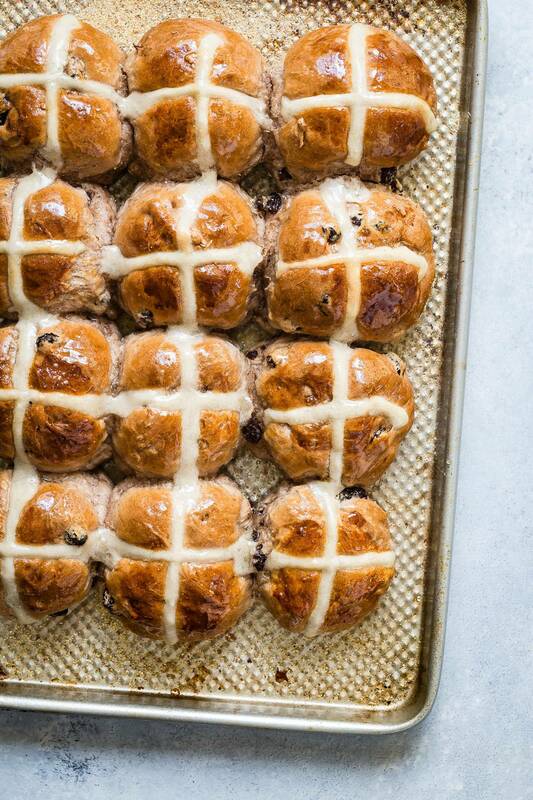 What’s the best way to eat my traditional hot cross buns? Hot cross buns are traditionally eaten on Good Friday two days before Easter Sunday. So if you decide to make these, Thursday would be the best time. Then all you have to do on Friday if you’re like me is slice them in half and spread a thick layer of salty butter on the inside. Keep them sealed in a large ziplock bag. To serve slice in half and place them in the toaster for a few minutes. Spread some good butter on each one and you have the perfect breakfast or coffee time snack! How do I make the cross on top? So I know you’re looking at my buns and asking yourself where’s the frosting? Sorry, but I grew up with the traditional flour and water mixture for the cross. If you prefer the frosting version, just skip step #10 and add you’re own. This post has been updated from its original publish date with slight recipe tweaks and new photography. 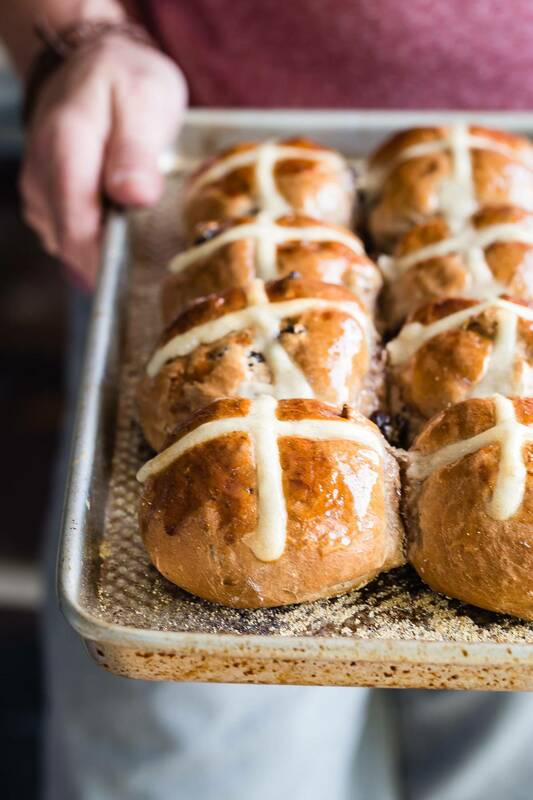 These homemade Hot Cross Buns are as traditional as they come! Soft and fluffy with juicy raisins and a sweet glaze top, they're perfect for Easter! Dust a baking tray with some cornmeal or flour. Set aside. In a medium bowl combine the warm water and yeast. Mix until dissolved. Add the sugar and egg and whisk until combined. Add 1 1/2 cups of the flour and mix well with a wooden spoon until it looks more like a smooth batter. It will be quite wet. After 30 minutes it should look bubbly but still very wet. Add the oil and salt and fold through with a spatula. Add the remaining cup of flour and mix into a ball. Transfer to a stand mixer with a dough hook and add the spices. If the dough is still a little wet, add another tablespoon or two of flour until it starts to firm up more. It should be soft but not too sticky. Add the raisins and mix the dough on low speed for 5 minutes. Transfer the dough to your table dusted lightly with flour and form the dough into a ball. Place the dough into a bowl which has been lightly greased with olive oil. Cover and let rest for about another 30 minutes. After 30 minutes or the dough has roughly doubled in size, knock all of the air out of it and divide the dough into 12 equal pieces. Roll each piece into small balls. An easy way to do this is to cup the dough under your palm and gently roll it in a circle while gently pressing down on it. Place all 12 dough balls onto the prepared baking tray in a 4 x 3 formation almost touching each other. Cover with a clean towel and let rise for another hour or until they have started to come together on the tray. While they are rising make the mixture for the cross. Mix the water and flour together to form a paste. Once the buns are ready for the oven, using a piping bag or zip lock back with the corner snipped of, squeeze the cross mixture across the buns in both directions to form the cross. Place in the oven and bake for about 20-25 minutes and golden brown. Bring the sugar and water to a boil in a pot. Simmer until reduced by about half and a syrup has formed. Glaze the buns when they come out of the oven and let cool. Best served the same day. I don’t recall ever making hot crossed buns but yours look perfect and definitely sound tasty. Nice recipe and great photos. I love these hot cross buns. They look so beautifully golden brown and tasty. Thanks Angie, have a great week! Thank you for the pictures! Visual cues are incredibly important and I always appreciate being able to see what something is supposed to look like at each stage in the process. I have thought about making hot cross buns a dozen times but never gotten around to it for some reason. Maybe this is my year! Yours look irresistible. This is a strange question, but what is the flour cross like? Does it taste like anything? And what is the texture like when you bite in? I’ve never had a hot cross bun before and have no frame of reference, but I’d probably go with the flour cross instead of frosting, too. Also, does the syrup glaze stay syrupy after the buns cool or does it dry into more of a donut glaze? Good questions Erin. The flour cross doesn’t taste of anything really, the buns are soft with some spicy taste from the spices and i love to spread butter on the inside. Another great thing about the flour cross is that it’s a lot less messy when storing them. The glaze drys in after about 12 hours but you can still see a slight sheen. Hey Christina, I can’t believe we haven’t crossed paths! I’m in Long Beach. 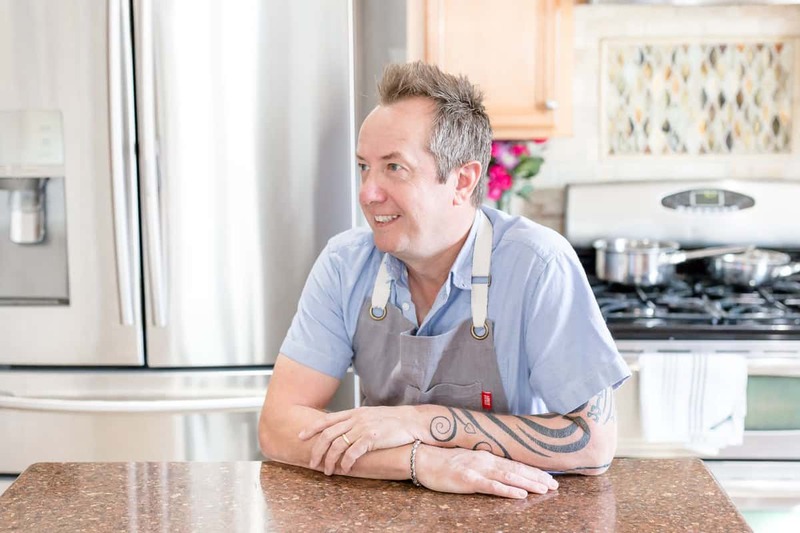 Judging at the baking awards sounds like a ton of fun! You are totally right—waiting is the hard part with yeast dough. And it is sooooo worth the wait. These buns are not part of my tradition, but I like them. It was fun to hear how much it was intertwined with your Easter memories. Food is such a powerful binder of memories and people. i always intend to do these every year for Easter and then stuff happens and I get busy and forget! I swear this year is the one and your recipe is the ONE i will be using! 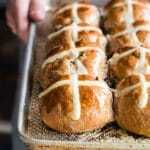 Gorgeous hot cross buns! I haven’t made them but now I must – love the warming spices! Is it weird that I’ve never had a hot cross bun before? I’ve seen them, but never tasted. I’m definitely wanting to try them now! These look great! “3 teaspoons Red Star quick rise yeast”…. do we need that particular brand??? and quantity??? Yes you do need that quantity but you could use another quick rise yeast if you can get it. These buns are delicious! I made them tonight and cant wait to toast some in the morning. I live in Tokyo and have been meaning to get around to making some one year. I saw yours and decided this is the year. Thanks for the great recipe. It’s a keeper! Thanks Victoria, Glad you like them! This is my first time on your site. Found you through pinterest. I love the name of your blog. I’m looking forward to trying these buns. Thanks for the recipe! I am Australian and have been sad about not being able o get the things I am used to for holidays. I have been looking for a traditional recipe and am so glad to find this one, I am proofing them as I type this and can barely wait to eat them they smell amazing! Thank you and Happy Easter to you. I’m pretty sure it should say, 6 teaspoons of water for the cross. I just made it with 6 tablespoons and there is no way it would stay on the roll, so I changed it to teaspoons and it made a perfect paste. Thanks Vicky, I just tested it and you’re right. I appreciate the headsup! Wonderfully written instructions, clear, concise and not too wordy. Step by step pictures always completes a good recipe. These buns look delicious. Would you recommend 2 separate batches over doubling the recipe? I am having a large family meal and need at least twice what the single batch makes. serves 12??? Or one homesick Australian!! I just used this recipe. I Love It!! My cross buns came out great I did add a extra tablespoon of sugar they are delicious. Just put these into the oven…. Loved the recipe, instructions and pics. I knew it was going to be a good one so tripled the recipe as I want to give some to my neighbours for Easter. Can’t wait for them to finish baking! wow, Chris kudos to you for tripling the recipe!! Thanks for the great feedback! I can’t wait to try this and wean mu husband off the store bought hot cross buns (with all the artificial ingredients). I don’t have a traditional dough mixer. Can I use a hand mixer with dough hooks? I just bake these hot cross buns. House smells heavenly. The only change I made was to add more salt. Curious about your reason for only using a pinch of salt. Thanks for a great recipe. Do you think the dough could be made in a bread machine? Hello! I made these hot cross buns for Easter. Never made them before. They smell fantastic! However, I just want to point out that I had to make way more of the “cross” mixture” than the recipe says, and the glaze isn’t enough to cover the buns entirely. Also, I would suggest warning people that this recipe requires lots of rising time for the dough. I thought it was less rising time since the recipe says 20 minutes. Thanks for the recipe though. Like I said they smell delicious! Thanks Tam, I’ll make some notes and adjust the recipe as needed. Thanks for the feedback, I really appreciate it. can i use sunflower oil instead of olive oil ? I’m proofing as I’m typing. Can’t wait to try them. First time trying to bake any type of bread. Had trouble with the cross mixture as it wasn’t enough water. Just kept adding water until it became a liquid and didn’t have a machine so had to do the dough by hand. Hope it turns out. Hi there, love this. Would you like to share this with the other participants in Food on Friday over at Carole’s Chatter? I have a weekly link up party – each week there is a different ingredient or theme. The current theme is Easter Food! 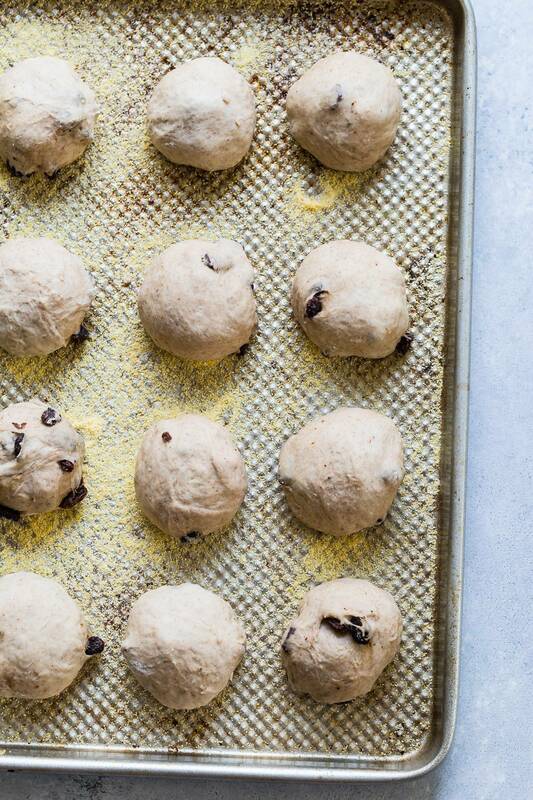 Could you freeze these before baking ? I doubled the recipe so I could freeze some for Easter. They turned out just the way they look in the recipe . The right spice mix and delicious taste. Excellent Carol, thanks for the feedback! I would like to make these for Easter brunch, do you think I could do the last rise overnight in the refrigerator? That would let me bring them to room temperature and bake after church in the morning. Hi Sherry, I think they would be okay kept in the fridge on a baking tray close to one another so they don’t dry out and covered tightly with a clean towel. This worked well in my breadmaker, pulled them out before final rise and made buns. I didn’t like the crosses, they turned out hard for me. Also I got 12 huge buns. Next time I’ll make 18 small buns. Made these today with a few adjustments for my taste, added the zest of an extra large orange and reduced the cloves by half. Skipped step 13. Added a little orange extract to the glaze. Only recommendation, Watch the bake time started with 20 and they were well-done suggest starting at 15-16minutes. They are delicious and very light, fluffy. Love that there is no dairy in them. Light glaze gives them just enough sweet. Love adding the zest and extract! Glad you liked them Lisa and happy Easter!